After repeatedly seeing Sara Ali Khan in various ethnic looks over the past few months, we can safely say that it might just be her go-to style. The actress has been seen in everything from lehengas to bright floral suits to plain white suits, and she wears it all with grace and elegance. In fact, Sara's constant pictures in various white suits makes us believe that casual ethnic can be quite chic. Last night, Sara was seen in yet another simple white suit that came with what looked like mirror work dupatta. Simple, classy, and effortlessly fashionable. And we are surely taking notes on how Sara channels her all-white style statement. If you want to rock an all white suit like Sara, there are a lot of options available in the market. Starting with the most basic piece, this Utsav Designer semi stitched suit material with Karachi work all over it certainly has what it takes to stand out The detailed work on the suit is pretty and elegant. Priced at Rs 849 after discount, you can get this here. 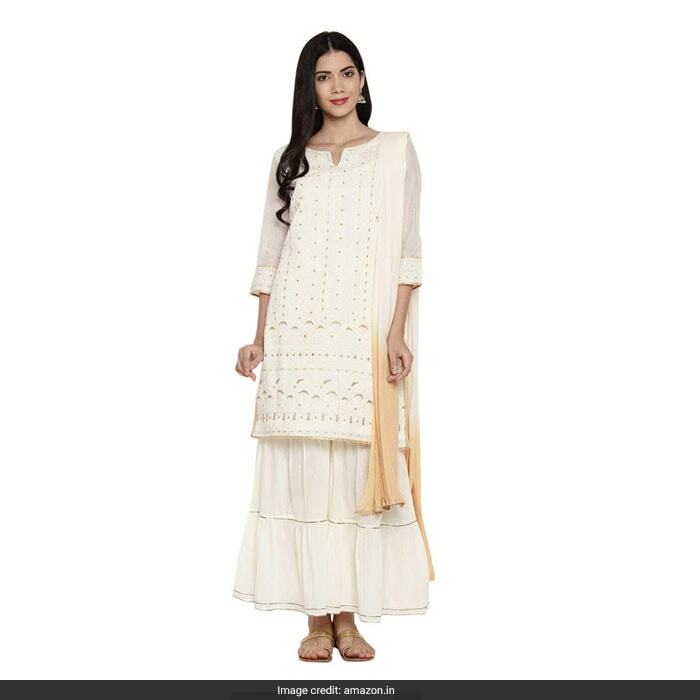 Another very elegant suit that we absolutely loved is this BIBA anarkali suit set. With golden thread work down the front of the suit and a dupatta that boasts of golden motifs around the border, the suit can definitely we considered for a wedding function outfit. Priced at Rs 3,999, you can get this here. Speaking of suits that will work for wedding function outfits, this Glamify semi-stitched sharara suit with floral embroidery all over it sure qualifies as one too. With mirror work around the collar and the hem of the suit, this piece is sure to draw eyes wherever you wear it. Priced at Rs 2,386, you can get this here. However, if you want to stick to simple suits that come with a twist, this Trishaa by Pantaloons suit that is a pairing of a straight palazzo with a kurta is something that you might like. This suit will also work for an everyday wear outfit. Priced at Rs 2,099, you can get this here. Looking for something more glamorous? 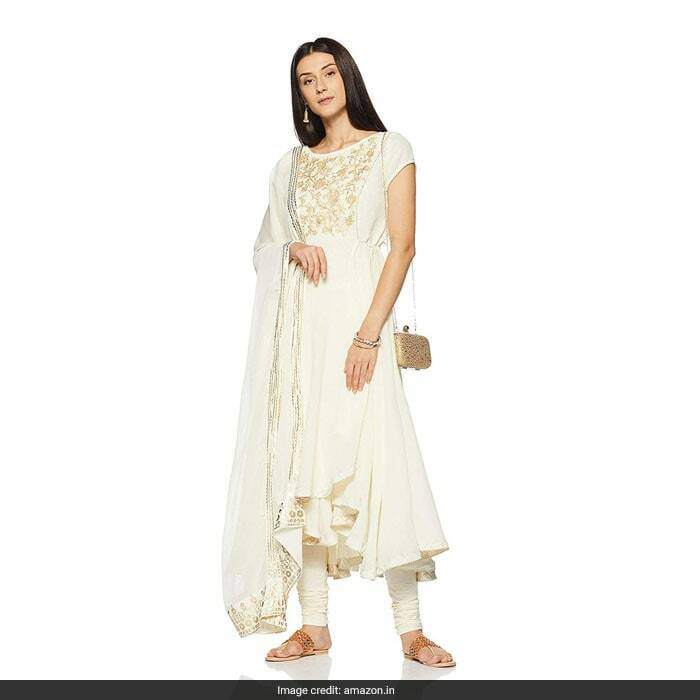 This RJ TRANDZ taffeta silk anarkali suit in white is what you should get. 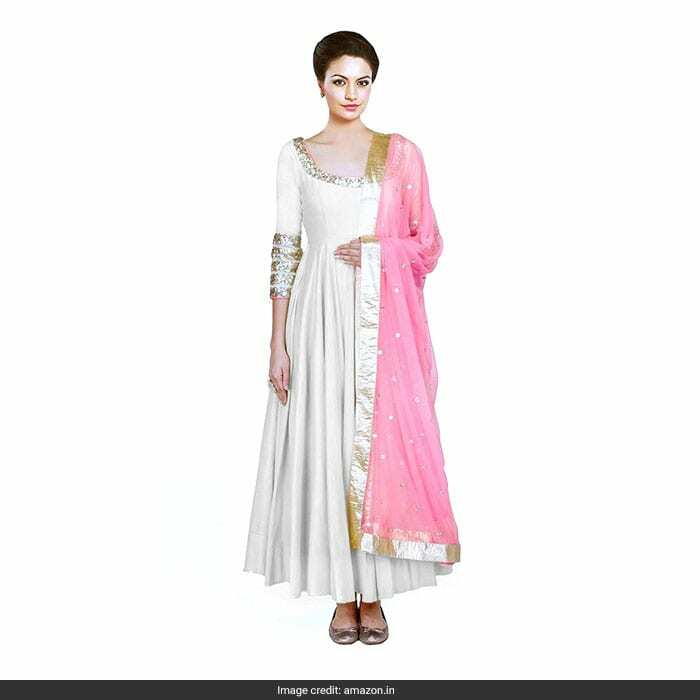 With gold trimmed collar and cuffs, and a matching pink dupatta, the suit is surely an easy way to wear white with a dash of colour. Priced at Rs 1.299, you can get this here. 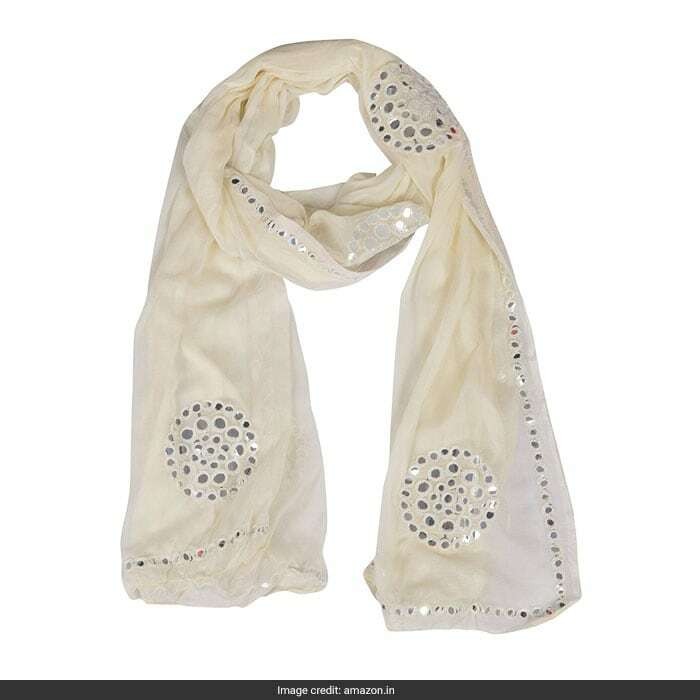 Oh, and if you really want a dupatta that is similar to what Sara is wearing above, this white Sanzari soft chiffon dupatta with mirror work should be good enough. You can pair this with so many ethnic looks. Priced at Rs 375, you can get this here. Which white suit would you go for?